Buy a discounted Adidas gift card and save money on the shoes and gear you love. If you’re an athlete, then you already know how good these shoes are. But did you know they also carry sandals, watches, eyewear, bags and more? In fact, they produce over 778 million units of product every single year. Now that’s a lot of sports gear! With departments for men, women, and kids, you are sure to find something for everyone! And just think of the money you’ll save when you purchase your Adidas gift card at a discount! Same great stuff, less money out of your wallet- now that’s a win-win situation! They carry an assortment of goods for running, soccer, basketball, football, golf, baseball, skateboarding, yoga and more! A discounted Adidas gift card will get you more for your money! And what’s more, all other coupons, sales, and promotions remain valid. For even more savings, you can sign up for their email newsletter and receive 15% off. Finally, buying sports gear doesn’t have to cost you an arm and a leg! An Adidas gift card from Cards2Cash will save you money on shoes, clothing and more. But saving money doesn’t have to stop there! Cards2Cash offers discounted gift cards for lots of national stores and websites! Check out our listings for Nike, DSW, Rack Room Shoes, and more! With Cards2Cash on your side, you can score big on savings every day of the week! 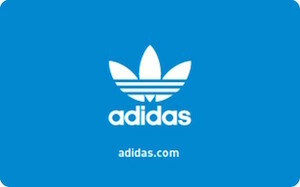 Do you have an Adidas gift card you aren’t going to use and would like to sell? Cards2Cash buys cards for lots of retailers! Why hold on to that unwanted card when you can turn it into cash in your pocket instead? We pay top dollar for lots of gift cards! If interested, visit one of our retail locations to get fast payment for your unwanted card OR fill out our simple online form, and we’ll make you an offer you won’t refuse. Whether you buy a gift card from Cards2Cash or sell one, we are your one-stop gift card shop!